The camellia, a popular evergreen shrub is widely grown in the south from zones 7 to 9 or where temperatures do not fall below 5�F. It is also the State flower of Alabama. Camellias, which are native to China and Japan are comprised of more than 250 species and hundreds of hybrids and cultivars. They are slow growing, compact plants, prized for their georgeous blossoms. The choices are almost limitless. There are single and double blooming varieties ranging in color from white through dark red, including bi-colors. Some hybrids produce blossoms up to five inches in diameter and many of the new cultivars are more cold tolerant and can be grown in some parts of zone 6. The two most popular species and their cultivars are japonica and sasanqua. Sasanquas usually bear single open flowers in the fall, whereas the japonicas have much larger semi double and double blossoms and bloom later in the season, from winter through early spring. The plants have an attractive growing habit with dense shiny foliage which seldom, if ever, require pruning. Mature camellias can attain a height and spread of ten feet and more. They prefer a semi shady location such as a sheltered area beneath tall trees. The soil should be loose textured, well drained and slightly acid. The best time for planting is during the cooler months. They are shallow rooted plants and will benefit from a layer of mulch to conserve moisture. Because of their shallow root system, they are susceptible to drought damage and should be watered deeply on a regular basis. If the plants are left too dry over a long period, buds will drop before they have a chance to open. 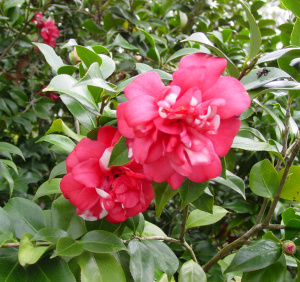 Camellias need only small amounts of fertilizer. A handful of all purpose fertilizer, two or three times during the growing season is plenty for a good sized shrub. When in doubt - lesser is better. Camellias keep growing year by year. If your plants have gotten too tall or have outgrown their consigned area, you can reduce their size by judicious pruning after they have stopped blooming - usually in late spring. There is no harm done to the plant if you prune at any other time of the year, but it may affect flower production. If you have a spot in your landscape that is suitable to growing azaleas, you also have the right conditions for camelias. Try one or more of these beautiful long-lived shrubs to add texture and background to your back yard garden.